They came from every parish of London, and from all walks of life. They ended up in a burial ground called Bedlam. Now scientists hope their centuries-old skeletons can reveal information about how long-ago Londoners lived. And about the bubonic plague that often killed them. Archaeologists have announced that they have begun excavating the bones of some 3,000 people interred in the 16th and 17th centuries. The remains now lie in the path of the Crossrail transit line. They will be pored over by scientists before being reburied elsewhere. One recent workday, just yards from teeming Liverpool Street railway station, researchers scraped, sifted and gently removed skeletons. In one corner of the site, the skeleton of an adult lay beside the fragile remains of a baby. The wooden outline of its coffin still was visible. Most were less intact, a jumble of bones and skulls. "Part of the skill of it is actually working out which bones go with which," said Alison Telfer. She is a project officer with Museum of London Archaeology, which is overseeing the dig. Due to open in 2018, the 73-mile trans-London Crossrail line is Britain's biggest construction project. It's also the city's largest archaeological dig in decades. The central 13-mile section runs underground. That has meant tunneling beneath some of the oldest and most densely populated parts of the city. For Londoners, it has brought years of noise and disruption. But for archaeologists it's like Christmas. Almost every shovelful of earth has uncovered a piece of history. What they have found includes bison and mammoth bones, Roman horseshoes, medieval ice skates and the remains of a moated manor house. Chief archaeologist Jay Carver says the Bedlam dig could be the most revealing yet. "It's going to be archaeologically the most important sample we have of the population of London from the 16th and 17th centuries," Carver said. Bedlam cemetery opened in 1569. It took the overspill as the city's churchyard burial grounds filled up. It is the final resting place of prosperous citizens and paupers, religious dissenters including the 17th-century revolutionary Robert Lockyer and patients from Bedlam Hospital. It was the world's first asylum for the mentally ill. The hospital's name is a corruption of the word Bethlehem. Today, bedlam has become a synonym for chaos. Tests on the bones by osteologists may reveal where these Londoners came from, what they ate and what ailed them. In many cases, it was the plague. There were four outbreaks of the deadly disease over the two centuries the cemetery was in use. One was the Great Plague that killed 100,000 people in 1665. Carver says researchers will analyze DNA taken from pulp in the skeletons' teeth to help fill in the "evolutionary tree of the plague bacteria." The technique was used to discover the plague bacterium. Its scientific name is Yersinia pestis. 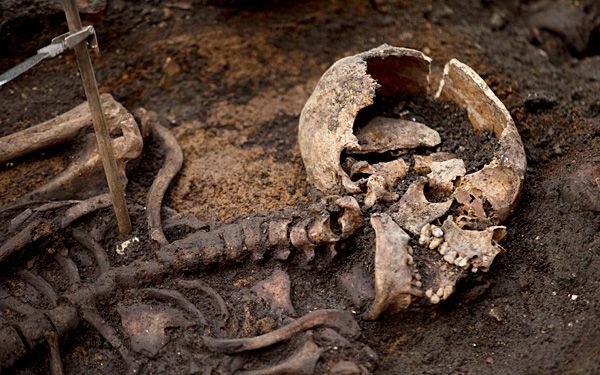 Researchers found it in 14th-century skeletons excavated at another Crossrail site. Many were victims of the Black Death that wiped out half the city's population in 1348. 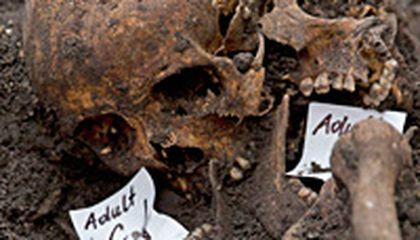 Scientists should be able to compare the bacterium found in Bedlam's plague victims with the 14th-century samples. It could help them understand more about the disease. The sickness still infects several thousand people a year. The researchers want to know how the illness has evolved over the centuries. Sixty archaeologists are working in shifts. They work 16 hours a day, six days a week. They will spend about a month removing the remains. After scientific study, they will be reburied on Canvey Island in the Thames Estuary. The old burial ground will be the site of a new train station. Its users will probably give little thought to the history beneath their feet. But Telfer says she never forgets that these fragile bones were once living, breathing individuals. "When you are doing something like this, you do feel a connection with them," she said. "I think you have a responsibility to treat them with great respect. It's quite a special process." Critical thinking challenge: For Londoners, this project has brought years of noise and disruption. But ultimately they will benefit. How? They will be successful after they finish their discovery about the bones and the plague. They would help many people and we would learn more about the history of the bones. This brought noise and disruption for Londoners because just hearing about bodies being dug up may make them feel uncomfortable. I mean these are dead bodies, if I heard about that I would be interested but still disturbed and disgusted.. I think it will benefit the Londoners because they have new pieces of history, and now the history is right in front of them because it is in there town. They will be benefited because most of the shovels uncovered a piece of history. They found lots of history and they could help people learn about that time. I want to be an archaeologist when I grow up. But I don't want to work 16 hours a day 6 days a week. I agree with the Londoners, it must be very noisy there. This article is about bodies and bones being found in Bedlam. Now scientists hope their centuries-old skeletons can reveal information about how long-ago Londoners lived. And about the bubonic plague that often killed them. Archaeologists have announced that they have begun excavating the bones of some 3,000 people interred in the 16th and 17th centuries. The remains now lie in the path of the Crossrail transit line. The subways will be poured over by scientists. Almost every shovelful of earth has uncovered a piece of history. What they have found includes bison and mammoth bones, Roman horseshoes, medieval ice skates and the remains of a moated manor house. "It's going to be archaeologically the most important sample we have of the population of London from the 16th and 17th centuries," Carver said. It was the world's first asylum for the mentally ill. The hospital's name is a corruption of the word Bethlehem. Today, bedlam has become a synonym for chaos. Tests on the bones by osteologists may reveal where these Londoners came from, what they ate and what ailed them. There were four outbreaks of the deadly disease over the two centuries the cemetery was in use. One was the Great Plague that killed 100,000 people in 1665. Carver says researchers will analyze DNA taken from pulp in the skeletons' teeth to help fill in the "evolutionary tree of the plague bacteria." The technique was used to discover the plague bacterium. Its scientific name is Yersinia pestis. Researchers found it in 14th-century skeletons excavated at another Crossrail site. Many were victims of the Black Death that wiped out half the city's population in 1348. But Telfer says she never forgets that these fragile bones were once living, breathing individuals. Will the Londoners postpone the date to open that railroad? What different types of bubonic plague are there? How was it so deadly to the people in Bedlam? Have most of us built immunities to this disease? This Is cool and discussing at the same time.